Editor’s Note: The Parks Conservancy will present its PX proposal at the Presidio Trust Public Meeting on Monday, September 23, 2013 at 6:30 PM at the Herbst Pavilion on the Presidio Main Post, 385 Moraga Avenue, San Francisco. Media are welcome and encouraged to attend. SAN FRANCISCO, CA: The Golden Gate National Parks Conservancy, the nonprofit partner to the National Park Service and Presidio Trust that has provided more than $300 million in support to the Golden Gate National Parks over three decades, has submitted its proposal for a new cultural center on the former Commissary site (currently Sports Basement) on Crissy Field. The complete proposal and renderings of the Presidio Exchange (PX) may be viewed at www.presidioexchange.org. The Parks Conservancy is one of three finalists along with the Lucas Cultural Arts Museum and the Bridge/Sustainability Institute selected by the Presidio Trust to submit proposals for this landmark park making opportunity. Drawing on its highly successful track record as the catalyst behind the transformation of Crissy Field, Lands End, Fort Baker, the Golden Gate Bridge Visitor Pavilion, and trails and overlooks throughout the Golden Gate National Parks, the Parks Conservancy envisions a world-class cultural destination that will connect park users to the Presidio as never before. “The PX will preserve and enhance the spectacular Crissy Field landscape and views, honor the legacy of the Presidio, and bring together people of all ages to experience this remarkable place in new and exciting ways,” said Greg Moore, Parks Conservancy President and CEO. The PX is a new civic space that curates and creates unique visitor experiences at the Presidio. Anchoring nearly 18 acres of new and revitalized national parkland, the PX will be a 97,000 square foot multi-use facility offering a set of interconnected indoor and outdoor spaces designed to accommodate a wide range of interactive public programs and activities, including installations, art exhibits, workshops, forums, demonstrations, concerts, performances, and more. As envisioned, the PX serves as a program hub and gathering place for public and a gateway to the remarkable assets of the Presidio. As a gathering place, the PX offers a range of indoor and outdoor spaces designed to welcome park visitors and offer settings for relaxation, discovery and enjoyment. The indoor “Living Room” and the outdoor picnic pavilion focus on enjoying the beauty and conviviality of this park setting. The indoor and outdoor spaces also host a wide array of programs focusing on nature, history and art including the indoor multi-purpose Open Space and the outdoor amphitheater. At the core of the PX vision is a commitment to working with local, regional, and national institutions and organizations that will serve as public program co-presenters and co-creators. Advisors from the High Line and Park Avenue Armory in New York, Millennium Park in Chicago, the Walker Art Center in Minneapolis, and the Los Angeles County Museum of Art are among the experts who have shared trends and best practices for creating successful and relevant 21st-century cultural institutions. To date, more than 30 PX Program Partners—including the California Academy of Sciences, National Geographic, The Aspen Institute, FOR SITE Foundation and the Bill Lane Center for the American West—have stepped forward with ideas for delivering culturally and ethnically relevant and enriching PX programming. Inside the PX, visitors will have access to a range of dynamic spaces, including the Open Space, a large and adaptable venue affording views to the Golden Gate; the Living Room, a free and accessible gathering area providing a comfortable space for orientation and relaxation; a café and restaurant offering sustainable and healthy food and drinks; a Demonstration Kitchen for culinary arts programming; the workSHOP featuring retail items made and co-created on site; and several flexible gathering rooms for public programs, meetings, and special events. Outdoors, visitors will discover new gathering spaces, a wind protected amphitheater, new picnic and outside dining areas, rooftop view terraces, and pedestrian walk and bikeways, including a landscaped Bridgeway linking the PX to the new “tunnel top” parklands that will result from the completion of the Presidio Parkway and Presidio Main Post. As with all of the Conservancy’s other park projects, the PX will adhere to the highest LEED and sustainable building and operating standards. Embracing, framing, and restoring views. Providing indoor facilities that fulfill visitor service functions, adapt for a variety of programs, and foster exploration, comfort, and conviviality. Creating an indoor/outdoor connection between Presidio buildings, grounds, walkways, and vista points. 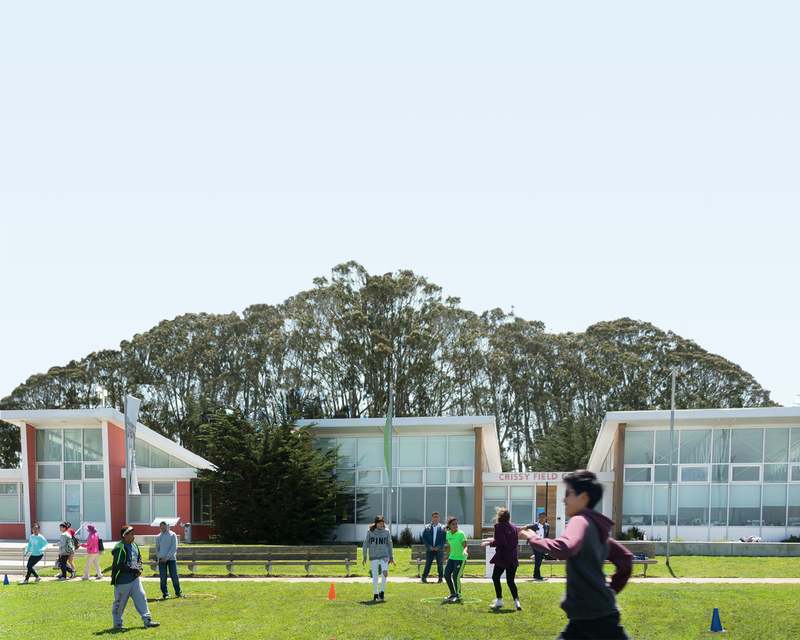 Offering a park design that connects the natural and open character of Crissy Field with the more defined, historic, and intended character of the Main Post. Providing an incentive for visitors to move between Crissy Field and the Main Post by creating an attractive, interesting, and fun connective space. In reimagining the next use of this spectacular site in the Presidio, the Parks Conservancy has assembled a world-class design team comprised of EHDD, CMG Landscape Architecture, and Equity Community Builders. Drawing inspiration from its PX program partners, expert staff and advisors, Conservancy members, and the general public, the Parks Conservancy is uniquely qualified to partner with the Presidio Trust, National Park Service, and the Bay Area community to create a 21st-century cultural destination of distinction in the Golden Gate National Parks. For more information on the Parks Conservancy and to read the full PX proposal, please visit the PX website at www.presidioexchange.org. All three final proposals may also be viewed on the Presidio Trust’s website at www.presidiotrust.gov.